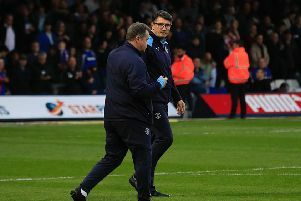 Luton chief Mick Harford admitted he has been looking at the conundrum of just how many points Town will need to achieve promotion this season. The Hatters have currently amassed a hugely impressive 68 points from 32 matches with just 14 games left to play. In the last 10 years, 89 points has been enough to ensure a top two finish from the division, meaning Luton could be as little as seven victories away from securing their place in the Championship next term. “All we can do is go out there, give it our best shot, winning the games. Midfielder Alan McCormack wasn't looking at anything other than this afternoon's trip to Fleetwood Town though, saying: "There's 14 cup finals now, but the first cup final is Saturday. "We get through that and we can start looking forward to the next game and keep rolling. "We’ve got our own little targets, we’ve got our own little way of doing things leading up to each game and each little block of games, so that will be our little challenge. "As long as we keep pushing ourselves and keep performing to our ability, I think we’ll get there in the end." Of the last 14 matches, Town have seven at home and seven away, but McCormack didn't want to get drawn into trying to work out what target Town need to go up. He added: "Saturday’s another game for us to go out and try and beat another opposition that’s trying to stop us. "That’s the mentality we have. "We don’t look at April fixtures, or end of March fixtures, we look at Saturday and Saturday is the only thing we can deal with, the only thing we've been planning for. "We’re going to try and get three points, we can’t do anything about two weeks time, it’s Saturday at Fleetwood Town. "They're looking to take three points off us and we’ve got to go out and make sure that doesn’t happen."